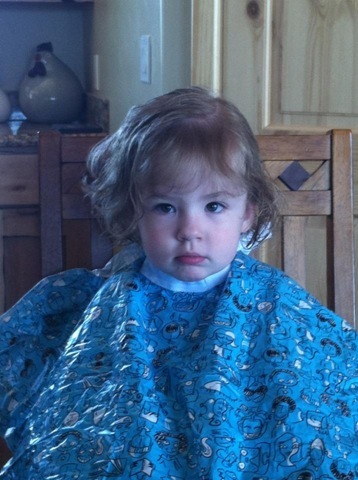 I was looking through some photos today and came across this one of my grand daughter Cecily and her first official haircut. Now as haircuts go, especially the first one, this was a superb haircut. But still, as cute as she is, she doesn’t look all that happy about it. Bryan is my brother in law. He married for the first time last year, he was in his late 30’s. Bryan married Diane. She had been married once before and came to this marriage with 2 young girls, Sariah and Julia. I know very little about the story of their courtship and marriage, that story is theirs. I would like to tell this story from my perspective. 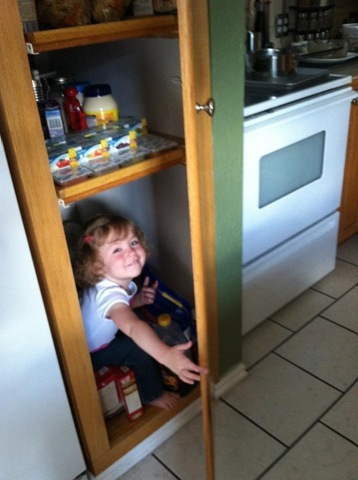 One thing I know for certain about children is that they all like to crawl into small spaces and hide. If you don’t have a place for them to do that, they will find one. Kids make tents out of blankets and a chair, they crawl under a bed, into a cupboard, into a box. The best playhouse in the world would never have been as popular with my children as playing under the quilt I was making. I know I’ve said this before but I just love men who love their children. I truly believe that when a man loves his wife and is besotted by his children, he is at his most attractive. I have raised 3 daughters, quite successfully if I do say so myself! Over the years I have talked to them many times about boys and then later about men. I was very concerned that they choose life companions that would bring them happiness, who were well suited to them. I felt the best way to make this happen was to help them go into relationships with their eyes open, recognizing who you are and who the person is you want to be with.